The University of Oregon&apos;s Matthew Knight Arena is a multipurpose indoor facility with a 12,000 seat capacity. 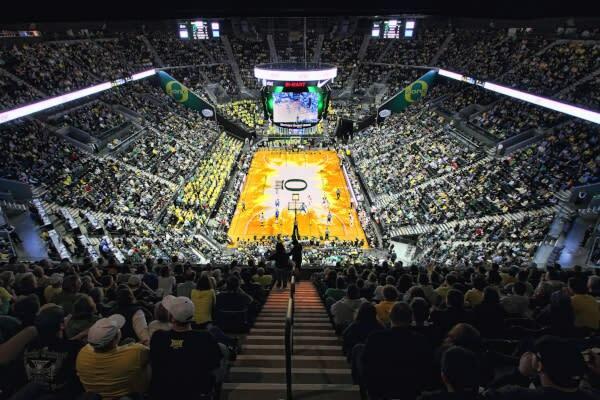 Primarily home to the Oregon Duck basketball teams, it is also well suited for large scale entertainment, conferences and other sports events. To date the Matthew Knight Arena has accommodated everything from bull riding to faith rallies to circque du soleil to rock concerts. Watch UO men&apos;s and women&apos;s volleyball and gymnastics here. And of course, basketball! The arena is adjacent the Ford Alumni Center on the edge of campus. It is conveniently located near plenty of hotels and local dining. Designed to support public transportation and bicycle access, as parking is limited. The arena strives to be the first LEED Gold certified arena in the NCAA, contributing to the UO&apos;s green initiatives. This massive venue is also architecturally stunning and culturally enhanced with commissioned artworks celebrating pioneer spirit and people power. Matthew Knight Arena was built in 2010 to replace the aging McArthur Court at a cost of over $200 million. Born out of a love for Oregon, and supported by two Oregon&apos;s two most successful and enthusiastic alumni: Nike&apos;s Phil Knight and former Oregon Athletic Director Pat Kilkenny. The arena is named for Knight&apos;s son who died at age 34; and the custom basketball floor was designed as a tribute to the Kilkenny family. It also features the largest scoreboard in the NCAA, over 200 TVs throughout the facility, 50 concessionaire stations, over 200 toilets and four loading docks. Prior to events at Matthew Knight Arena, gather with students at nearby watering holes including the Wild Duck Café, Elk Horn Brewery, TREV&apos;s and Track Town Pizza.